On the evening of August 9, 1881, a group of well known citizens met at Benner Humma’s Hotel at 10th and Washington Streets. They met to discuss the start of a project that would culminate eight years later in the construction of the Mount Penn Gravity Railroad. In attendance was, William I. Graul, 8th Ward Alderman, John D. Mishler, Manager of the Academy of Music from Penn Street, Lewis and Dominic Kremp, real-estate dealers, John P. Dauth, stove & tin ware maker, William Rosenthal, Publisher of the Daily Post; Banner Von Berks and Biene & Dutsche Eiche, Solomon S. Kindt, Register of Wills, George K. Whitner and Benner Humma. By 1889, the Mount Penn Gravity Railroad was organized to provide scenic transportation with a full view of the spectacular mountainside to vacationers and sight seekers traveling to the local resorts, clubs and wine houses. Inspired by the Mauch Chunk Switchback, there is no grander view anywhere. A glorious panoramic 30 mile view and a changing kaleidoscope of beauty connects the mountains, the city, and the River. The Gravity Railroad provided the excitement of a mountain ascent through the beautiful glen overlooking Mineral Spring Park and onward into Egleman’s Park through the heart of the cool and shaded forest where the air is pure and the water is clean, and across Skyline Drive to the “Summit” at the top of the Mountain. Convinced that the Gravity Line needed something at the Summit for attraction, the company, in 1890, built A magnificent stone dance pavilion known as the Tower Hotel. Once there, you could enjoy one of the largest dance floors with entertainment by famous bands such as the Germania, Ringgold, and Reading Symphony Orchestra. Adjacent to this were bowling alleys, shuffle board and billiard parlor, refreshments and a novelty stand. Graphophone or “nickel-in-the-slot” entertainment cylinder or phonograph type concerts amused the children. Providing power for the trip to the Summit was a steam locomotive named “The Wm. Penn”, which was a 20 ton 0-4-0 tank engine that pulled the old Brill-built open railcar with steam power that topped out at a speed of 15 miles per hour. The company actually had 3 locomotives: a Baldwin locomotive, which weighed 22 tons and was capable of drawing two cars to the Summit, and 2 Shay gear-type locomotives. All burned wood for power. These Shay gear locomotives were of special construction so that they could take the sharp turns leading up and down the mountainside. Each railcar carried 6 people per seat with 12 bench seats that could accommodate 72 passengers. At times, gentlemen would ride on the running boards. At first, the cars had only a system of hand brakes. However, within a year, newly developed air brakes were added. The engine would pull the car 3 miles to the Summit, where it would then be released and switched behind to push the open trolley on its way by total gravity 5 miles down the back end of the mountain to the starting point, while the locomotive then backed down the same way from which it came. At the start of the 1898 summer season, the Gravity converted from a wood burning engine to an electric engine. One of the most famous electric cars in the fleet was painted white and dubbed “The Laurel”. It was loaded with two 37 ½ horsepower motors. The general office of the Mount Penn Gravity Railroad was located at 536 Court Street, Reading, Pa. while the superintendent’s office was at the Mineral Spring Park Station or Terminus. The original officers of the Gravity Railroad Company were: President Jonathan G. Leinbach , Vice President Matthias Moyer, Secretary/Treasurer Frank S. Livingood, Solicitor H.A Muhlenberg, and Superintendent J. Ashton Parker, Wm. B. Harper, and then Calvin.M. Dechant. The Board of Directors & Stockholders consisted of James Nolan, S.E. Ancona, Thomas P. Merritt, Jesse G. Hawley, M.B. Mc Knight, W.R. Mcllvain, F.S. Livingood, J.G. Leinbach, John Barbey, Ferd Goetz, and James & Charles Rick. The Stockholders included such names as, T.P.Moore, Charles Jackson, Philip Zieber, Wm A. Sands, Wm H. Dechant, J. George Hintz, Charles Lichty, John A. Rigg, Wm Rosenthal and John B. Dampman. The operating crew consisted of Charles Rettew & Charles Kendall – Conductor, Benton Ancona – Engineers, Joseph Firing-Fireman, Franklin Helder, John Thompson & John Snavely – Brakemen, Charles Stout – Ticket Agents and Joseph Johnson – Chief Engineer. A stone and framed depot/terminus was erected on a slope opposite the present tennis courts in Pendora Park. On the first floor, there was a ticket office, which was managed by G.T Bassler, and a small vanity room. Company officials had offices on the 2nd floor. On the outside was a waiting platform covered by a huge wooden portico. A portion of this cement platform can still be seen today. On March 25, 1890, officials and invited guests filled the railcars for the first historic trip. The travelers turned in their seats at the beautiful views revealed at every curve along the way. Just of note, the first women to ride the Gravity were Miss Sallie Missimer and Mrs. Charles D. Spohn, who just happened to be standing on the depot deck at the time. The total trip of 8 ½ miles took approx. an hour, with numerous stops. The cars ran at regular ½ hour intervals throughout the day, carrying approximately 720 people each day and charging a 20 cent fare (or 6 passes for one dollar), with children’s tickets at 15 cents. Excursion rates were also available. The summer schedule allowed the trains to leave the station at 5 minutes after each hour until 6:05 p.m. from the 1st weekend in May until Thanksgiving. Tickets allowed passengers to board or depart the train at various stops along the way. Some of the stops included resort homes, vineyards, and picnic grounds strategically scattered throughout the mountain. The circuit ran north from the terminus station in Pendora Park near Miller’s City Park Hotel, Mineral Spring Park and Hotel, thru the Rose Creek Valley just below the Hessian camp to Eglemans Park on the right, The Bavarian Club, Fred Kiedeisch Wine Resort at Lauterbach’s Spring, Rhein’s Curve, South Curve Gravity Park, Schwartz’s Summit House Hotel, The Tower Hotel, North Curve, Goodharts Crossing, Kuechler’s Roost, Wildwood Park at Antietam, Path to Reiniger’s Vineyard & Wine House, Steigerwald’s Winery, Sphuler’s Hotel (latterly Haag’s Mt. Manor), Mountain Springs Association, School House Crossing at Spook Lane, Mt. Olympus Family Circle & The Eagle Mountain Home. The Gravity carried thousands on a fun-filled scenic route throughout the mountainside. Accounts indicate that at it’s height of popularity, Spuhler’s Mountain Resort also known as Haag’s Mt.Manor served an estimated 15,000 gallons of berry and fruit wine to over 2,000 excursionists on an average weekend. This popular resort was well known for its Concord, Clinton, Currant, and Gooseberry wines & baked clams. In latter years, many may also remember that Evelyn Haag Luther, a retired Stony Creek school teacher, lived here with her 50 dogs and numerous cats until her death in 1977 when the building was razed. Hidden amongst the rocks and trees lived Louis Jacob Kuechler, the big bearded Santa Claus of the hills. His pig roasts, hasenpfeffer lunches, domestic & foreign wines & beers were an odd surprise. Over at Lauterbach Springs, many raved about the cheese & limburger sandwiches, potatoes & sauerkraut dish with a slice of Pauline Kiedeisch’s famous baked rye bread for a cost of 15 cents. It was mentioned that throngs filled the grove for a taste of Fred’s Champagne Cider which he made from his own apples. In its 33 years of existence, there were only 2 tragic incidents. On August 22, 1890, car #9, having nearly completed its run while rounding the “Hairpin Curve” at Aulenbach’s Cemetery, left its tracks plummeting down a 70-foot embankment, leaving 5 people dead and 20 injured. An investigation revealed faulty brakes. One account of this tragedy was detailed by the engineer, Charles Kendall, who was at the Summit and attempted to pursue the runaway car. He stated: “After the engine reached the “Black Spot”, or the Summit, it had been uncoupled from the car. It was noticed that the car began to move backwards so the crew threw a chock of wood on the tracks to block the wheel. After the car had been released, they all knew something was wrong when it would not stop as it approached its usual stops.” This was when brakeman Franklin Helder and conductor Charles Rettew, along with attorney Edgar Levan frantically tugged at the air brakes until one of the chains broke. There was no hope of stopping them. The car soon gained rapid speed. It dashed on at a frightful speed and just before reaching Antietam Curve, brakeman Helder leaped from the car. Others, like Mrs. Hiram Schitler and Mrs. Charles Cooper, with her baby in her arms, hysterically leaped from the car. All were panic stricken at this sight as the car thundered along out of control down the mountainside. The remaining passengers went to the rear end of the car and crouched down on the floor and waited for the crash. Few words were spoken, but the terror was depicted on their faces as they held on with both hands for their lives. In the next moment, the car sailed through the air striking the trees and making a complete somersault, the car rolled smashing onto the roof, demolishing the car and Injuring its passengers. The injured were treated at St. Joseph Hospital in Reading by Dr. Daniel Beaver. Among the injured were: Bessie & Katie Kelly of West Chester, Mr & Mrs. Nathaniel Schitler, Willie Schmehl, his wife and their son Nathan. Mr. Schmehl, was taken to St. Joseph’s, he had both legs broken, with the right leg broken in 9 places. Mrs. Arnold Lewis had severe bruises and both arms were broken below the elbow, however her condition was not considered as serious as that of the others. Although Mrs. Cooper was treated and released the same day, her 13-month old child did not survive. Mrs. Hiram Schitler had suffered severe blows to the head and chest along with a dislocated shoulder. She required a number of stitches in her scalp and part of her cheek and ear were torn off. A passenger identified as Miss Bye who was breathing so faintly that she was pronounced dead at the hospital but was (luckily) rubbed vigorously and revived by the Mother Superior. More of the injured were taken to the Schitler’s home at 42 North 8th Street in Reading which was being used as a make shift hospital. The fatalities included the conductor, Charles Rettew, attorney Edgar M. Levan and Miss (Dr.) Harriet Hinkle, an 84 year old well known cancer doctor, who had practiced for 64 years in Philadelphia, and her sister Miss Marla Hinkle. The scene of the accident was cleared and reports indicated that the wrecked car was returned to the railroad car house at 19th and Perkiomen Avenues. Car #9 had an air-brake attachment that was connected with the hand brake, practically making it one brake. One theory on the failure of the brakes is that the vacuum chamber was partially exhausted, and that the power, when applied, simply pressed the brake blocks against the wheels without sufficient force to stop the wheels. Unfortunately, the force pressed the brakes so close that it destroyed the leverage to apply the hand brakes. From that day forward, there would be 2 brakemen to each car and they would be using the hand brakes. And as a matter of additional safety, the Company has supplied each car with 4 cone-shaped iron wedges, 15 inches long, which are placed beneath the floor and can be reached through trap doors. The cars can be immediately stopped by opening one or more trap door and dropping the iron wedge down the transom and the brake shoe. But, unfortunately a second accident occurred on November 5, 1891. The Reading Eagle interviewed Mr. George Johnson, a passenger, and a tinsmith, who had been working at the Summit House and was heading home on this rainy & misty day, when open car #1 coupled to closed car #10 nearly completed its run carrying six passengers rolled on just above” “Cemetery Curve” near Mineral Spring Hotel but did not slow down as was customary, when approaching the curve. He looked around and saw conductor & brakeman frantically pulling on the brakes, He saw their reaction as they crouched down on the floor of the car. Mr. Johnson jumped off, rolled and ran to get help. The next instant, with a jump, and a force that lifted the front car from the tracks and sent both cars catapulting against the north side of the “cut”. Deaths included the 24-year old conductor Irving Hauck of Plum Street and brakeman Anthony C. Keely. Serious injuries were suffered by Miss Mary Beck & Francis Klemmer, of Philadelphia , and their friend Mr. Ganter of Carpenter Street. The cause of this accident was attributed to wet leaves on the tracks. Over the winter of 1891, major changes were made to the deadly curve, adding a switch back and a safety incline or runaway track which reduced the force of the curve. Incidentally, there were two other tragedies that occurred that did not involve any mechanical or structural problems. When word of the crash reached Miller’s Park, it was received with dire excitement, as Mr. Miller’s son, C. Frank Miller was on the fateful ride. Frank, with only a head injury, lent such valuable aid in taking out the dead & wounded. By three o’clock that afternoon, Frank said his head hurt and he laid down in bed & slipped into a coma. By Sept. 2, 1890, Dr. Mohr pronounced Frank’s death from Brain Congestion. On July 8, 1907, the Reading Eagle reported that Harry H. Newmoyer, 32 years old from 405 North 11th Street, was killed at Barto’s Crossing on List Road. Reports show that Newmoyer fell asleep along the tracks and was struck by a trolley at 9:15 p.m. It was noted by conductor W. Crum that nothing was seen by those on the car until a jolt was felt and the conductor stopped to investigate, only to find a gruesome discovery. Despite these tragic accidents, the Gravity Rail system continued to be Reading’s major attraction serving an estimated 80,000 riders a season. In June of 1891, the railroad also received positive publicity when thirty four members of the Philadelphia Public Ledger Staff, known as the “Jauntes”, published an account of their experience on the Gravity in their Sunday Supplement. They raved about the wonderful and fun filled ride thru the beautiful mountainside in Reading, Pa.. Further compliments were given at the National Encampment of the Ladies Auxiliary of the Union Veteran Legion meeting held in Reading in January 1891. The National President, Mrs. Mary C. Seighel of Altoona, made an excursion on the Mt. Penn Gravity. She related a very favorable account in the Grand Army Gazette, describing a feeling of freedom and grandeur from riding high across the mountaintop. On this particular day, her group was accompanied by the Germania Band which played while the ladies sang along. A visit by the State Editors in 1893 resulted in publicity for the Gravity in the Osceola Mills, (Clearfield County), Leider-Courier & Wilkes Barre Telephone Company, pronouncing that the people of Reading are “blessed in having such a charming retreat for the hot sultry summer nights”. In its time, the Mt. Penn Gravity was a ride that was unsurpassed. It spread word of Reading across the state and brought thousands of visitors to the city. Virtually any day of the summer, it was not uncommon for excursionists from Philadelphia, New York & Wilkes-Barre to travel on the Gravity. One time there were dinner reservations for 800 people at Miller’s City Park Hotel which was located at 19th and Cemetery Lane (also known as Pendora Hotel). The hotel was under the proprietorship of Charles B. Miller for 25 years until his death. The hotel featured a grand dance floor and wide side porch and tables in the beer garden. There were swings, slides, see-saws for children, and outdoor stone fireplaces with picnic accessories. Also popular and nearby was Sweeny’s Dam which was a favorite place for swimming and fishing during the summer and ice skating in the winter. Just below the dam was Reading’s first zoo (near the tennis courts in Pendora Park). Comprised of 2 Elk – Buck & Kitty, 2 Bear – Rose & Teddy, 2 Deer, 2 Horned Owls, Pheasants, Squirrels, Ducks & several Swans donated by Wm. H. Luden. During the construction of the Lindbergh Viaduct, a number of workers boarded at Miller’s. Due to the construction and development of Pendora Park starting in 1907, this popular resort was razed around 1934. In spite of its fame, the Gravity rarely made a profit, and failed to pay off its debts. The original investment of the company was approximately $100,000.00. Due to the accident, multiple claims were filed by the injured and their families, mounting to a $22,200.00 deficit, extensions needed to be made with stockholders. After paying the mortgage each year, the Company went into debt until 1898, when the line was electrified with the addition of six motorized cars providing a less expensive means to run the line. By 1919, the Gravity boasted a total of 140,205 riders. With the coming of the automobile and the 1920’s Prohibition Era aided to the decline of local resorts, and strained the popularity of the railroad, but not as conclusively as the devastating fire on the evening of April 26, 1923, which destroyed the Tower Hotel. This fire shocked the city. Shortly thereafter, the railroad tracks were torn up and sold for scrap, heralding the demise of the 33-year run of the once grand Mt. Penn Gravity Railroad. Today one can view the joined remains of two Gravity Brill built open trolley cars which have been gracefully transformed into pavilions, a sad memorial of all that is left. There is one that stands beside a residence at Hill Road & Glenn Road and another located on the side of the Lower Alsace Township building on Carsonia Avenue. Another remnant of the Gravity Railroad is a cement slab to the south of the Lindbergh Viaduct, and stone pillars on the north side which indicates where the Gravity station once stood. Portions of the graded rail beds are still evident in certain areas around Mineral Spring Park. Some of the railroad’s paths now cross portions of Hill Road, Haags Road, Spook Lane, Angora Road and other roads that were once on the Gravity route. 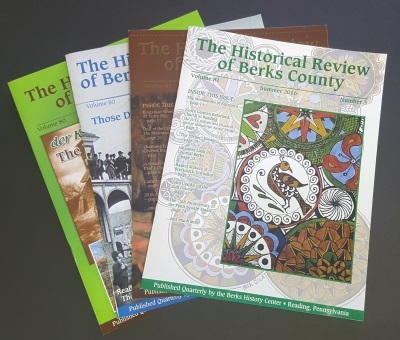 A version of this article, third place winner in the 2008 Hiester Manuscript Competition, originally appeared in the Summer 2009 issue of The Historical Review of Berks County.